Bumper, adjustable type, hood front. Replaces original GM part #1239472 & #1347890. 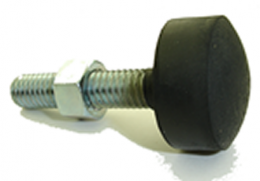 Cadmium plated bolt 5/16-18 x 1-1/4", rubber bumper 1-1/8" in diameter, 5/8" thick. Sold individually. MADE IN THE USA.